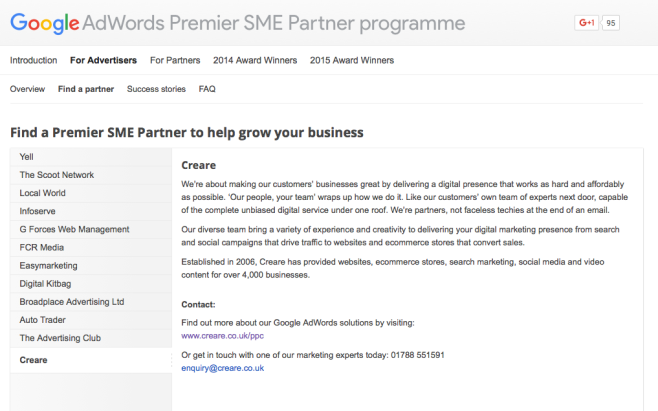 Adwords SME Premier Partners â€“ We did it! 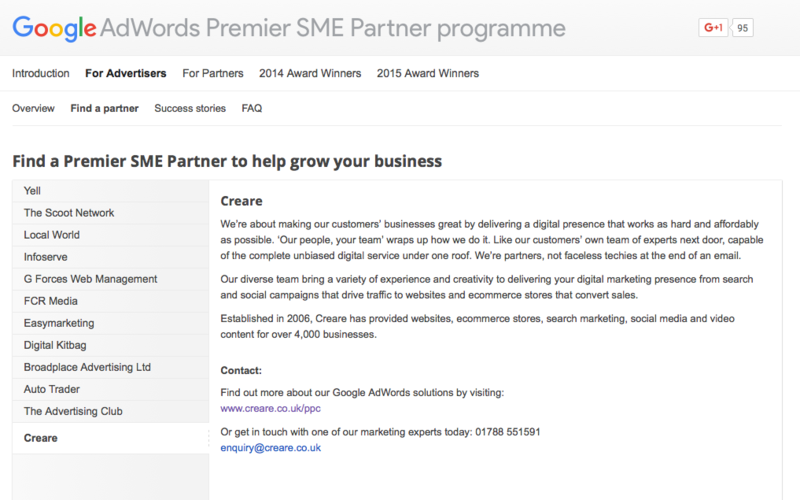 Last week at Creare we announced we had become the newest edition to the prestigious Google Adwords SME Premier Partner programme. This is a great achievement and shows how far we have come with our PPC (Pay-Per-Click) service in a relatively short space of time. I still remember well when we got our first PPC client a few years ago and how different paid advertising was to the traditional organic service that Creare had been successfully delivering for years. Back then I was the only person dealing with PPC here and it really was a learn on the job experience as we took on a client with an existing account. Not only did I have to quickly learn how to successfully manage a campaign, I didnâ€™t have the luxury of being able to make any mistakes as these would have shown in the accounts performance and would of resulted in the potential loss of a valued customer. I think this â€˜baptism of fireâ€™ helped though as it meant I had to learn the Adwords platform back to front, and I feel, that this education has placed Creare and our PPC clients in good stead ever since. Over the years our PPC client base grew as our PPC skills and knowledge expanded and we began to take on more campaigns. At that time, the focus of our work was generally on smaller SME accounts, maximising the return on relatively low value campaigns takes an enormous amount of focus and we needed to ensure that we proved the value of PPC in helping smaller SMEs grow into bigger companies. Over time we started working on bigger campaigns and it was that experience on delivering great value for smaller SMEs that now allows us to deliver a return for campaigns of all sizes. Being able to provide decent ROIâ€™s (return on investment) for the growing eCommerce stores and clients looking to take their business to the next level where the extra sales and leads really made a difference to their business, was something I was and still am, most proud of. For our SME clients every penny spent matters so our accounts have to be really tight with minimal click wastage and they need to be ultra relevant to the clientâ€™s product/service offering so we can really leverage the quality scores. We have to ensure any changes made in the account are based on data fact (not opinion) to ensure we can almost guarantee the changes we make will have the desired effect. Ensuring a PPC campaign makes a return for a SME client and thus helping the client to grow their business, is what Creare are all about. Whatâ€™s great now that we are officially Google Adwords SME Premier Partners, is we can continue this good work driving our PPC service forward as we get increased support and training from Google. This guidance will help us to keep on top of new features and methods of delivering profitable campaigns. On a personal level the awarding of the Google Adwords SME Premier Partner status to Creare verifies the standard of the work that I and other PPC team members are doing. One of the largest companies in the world has joined their name with ours and I am so proud to have been a part of this journey!